When it comes to bridal wear, no one does it better than Delhi! With multiple stores and the top designers, Delhi is one of the best places for wedding shopping in India. From accessories to groom’s wear and everything in between – these shops have it all! So if you are planning your wedding shopping in Delhi, here are some places you must check out! Our list of the best places for bridal shopping in Hauz Khas, Delhi will surely give you some much needed inspiration for the D-Day! Read on to find out more about these hidden gems! Dolly Jhunjhunwala, a painter and architect, took to designing clothes a few years ago and came up with Rewaz by Dolly J. She is always on the lookout for new weaves and texturing on fabrics and combines these with traditional prints and embroidery to create unique things. She is also a member of the FDCI and with her expertise; your bridal shopping in Delhi will be a successful affair. Every gorgeous piece at the Ole Couture is picked by Shivani Madan, who has succeeded in gathering some of the best designers under one roof. Samant Chauhan, Pooja Shroff, Nimai and Reboot are some of the many names that you can check out at the Ole Couture. Your wedding shopping in Delhi will not be complete without a trip to this fabulous place which has lehengas, accessories, shoes and other essentials. With over 30 designers under its roof, Ogaan is a one stop shop for all your wedding shopping needs. Amrita Thakur, Anamika Khanna, Kavita Bhartia, Raw Mango, Deepa Gurnani, Nidhi Tholia and Rashmi Varma are some of the many brands which showcase their work in Ogaan. Whether you are looking for accessories or wedding lehengas – they will have something for everyone. Head to Aumbre in Hauz Khas Village and you will be impressed with the wide variety of options available at the store. The efficient staff can also guide you to help you choose the perfect dresses and accessories for your big day. Luxurious fabrics, rich colours, impeccable fit and gorgeous embellishments make their creation sand apart. Their wedding wear is a surreal piece of art and is sure to make your bridal day look an artistic one. Megha and Jigar aim to blend the traditional craft of India into the ever changing face of fasion. No one does it better when it comes to fusion art. Niket and Jainee aim to fuse traditional art into contemporary design and they do so seamlessly. With a rich palette of colours and intricate designs, their creations will surely impress you and make you look absolutely stunning! Layering and mixing and matching prints are some of the many techniques that Monapali uses to create exquisite and unique bridal wear. Their rich fabrics combined with the stunning colours create wonderful bridal attires that will surely sweep you off your feet. 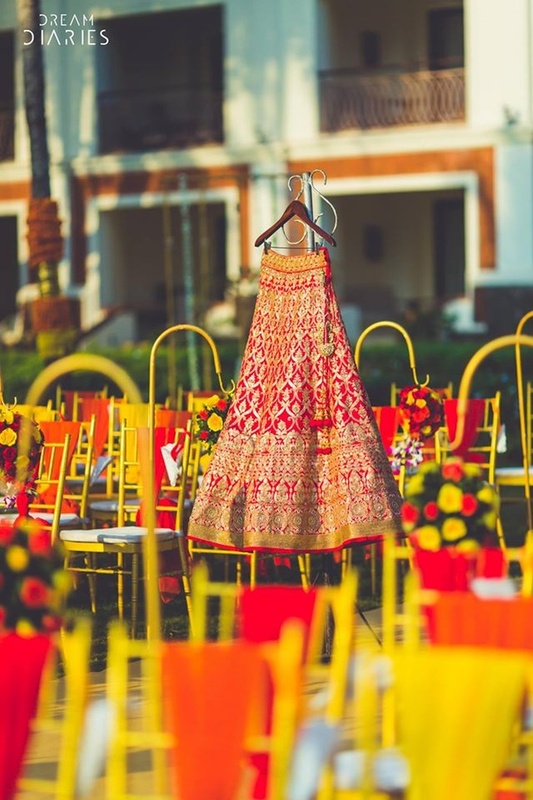 If you are still looking for your bridal lehenga, you can check out these designer lehengas! Here are the latest trends in wedding lehengas for more ideas! Also check out the wedding lehenga trends of the year here!